The ear is a good biometric characteristic since it is full of features, it is a stable structure, which varies little with age, and it does not change its shape. Furthermore, ear is larger in size compared to fingerprints but smaller as compared to face and it can be easily captured without a fully cooperative subject. The main approaches proposed in the literature to extract relevant information from ear works on 2D images or on 3D images. An ear can be imaged in 3D using a range sensor which provides a registered colour and range image pair. A range image is relatively insensitive to illuminations and it contains surface shape information related to the anatomical structure, which makes it possible to develop a robust 3D ear biometrics. Unfortunately, the performance of 2D image-based methods is greatly affected by the pose variation and imaging conditions and is dramatically lower than that obtained using the 3D data. 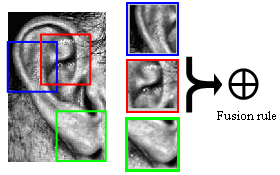 The Biometric System Laboratory proposed an approach for 2D ear authentication based on the extraction of "local" features from several sub-windows of the ear image and their combination in a multi-matcher system.